The reflection staring back at me in the mirror that night wasn’t “me.” This girl was streaked with mud, hadn’t washed her hair in days, and had pit stains down to her waist. Four months later, I found out what happens when you drop a perky prom queen with a love for platform sandals and hygiene into the Bolivian Amazon with no air conditioning, billions of bugs, and a single bathroom to share between 13 teenagers. Until this experience, I would have told you that the “authentic” version of me was poised and put together. Being a teenager, I demonstrated this through fashion: Handbags coordinated with the rest of my attire and perfectly manicured fingernails. Quite quickly, I realized that being "put together" was of no value when aggressively scrubbing spider larvae off of cement walls. Early on in that month I determined to push through the homesickness and sense of disorientation that came from not knowing how to be successful in a strange new environment and culture. By end of the month I could add another word to that list of "authentic" traits: Adaptable. The way out of the authenticity trap is by taking action, putting yourself into new situations that draw out your potential. These experiences aren't about reinforcing who you already are, but about discovering who you could become next. Action is your superpower. It transforms you. Are there any ways that you're letting "authenticity" bind your powers? If you catch yourself saying "That's not my thing," could it be? If you decide not to pursue an idea or interest because "I'm not really that type,"...are you sure? If you turn down an opportunity because "I couldn't do that,"...have you tried? 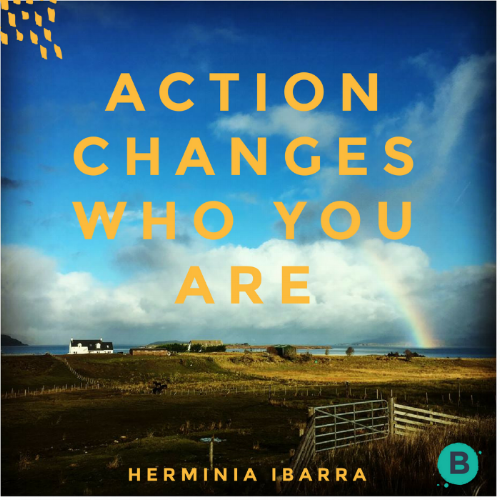 This week, why not take one new action and see what happens? If you take this challenge, please drop me a line at Laurah@betterbetter.co with a brief note on what you learned or gained. I'd love to send you a special gift in return.